Zacks Earnings ESP (Expected Surprise Prediction) is our proprietary methodology determines which stocks have the best chance to surprise with their next earnings announcement.The Earnings ESP shows the percentage difference between the Most Accurate Estimate and the Consensus. This percent difference equals the expected surprise prediction. Finding stocks that are likely to beat their quarterly earnings estimates, and soar, is an extremely difficult task. There are plenty of times when a stock beats its estimate but fails to rise, or worse, after earnings are released. Some believe that these poor results can be avoided by hunting for 'earnings whispers' right before a quarterly release. This process looks to get the inside scoop on analyst estimate revisions ahead of the report in order to detect those that are most likely to unexpectedly beat or miss their earnings consensus. After all, wouldn't it be great to know which stocks are likely to have earnings surprises ahead of their release dates? And also which stocks are likely to disappoint before their share prices plummet? We have cracked the code with our new Zacks Earnings ESP system. This method predicts earnings surprises with 7 out of 10 accuracy. 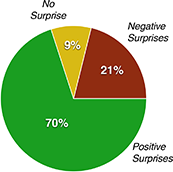 And when it is filtered with Zacks Rank #1 Strong Buys, #2 Buys, and #3 Holds, it gains an average of +28.3% per year. Read on to learn more about this statistical groundbreaker and how it could help you this earnings season, and for years to come. This Zacks Earnings ESP (Expected Surprise Prediction) is our proprietary methodology for determining which stocks have the best chance to surprise with their next earnings announcement. Once we have these two figures, we compare the Most Accurate Estimate to the current Zacks Consensus Estimate, and the resulting percentage difference between the two equals the Expected Surprise Prediction. How Accurate is Earnings ESP? Earnings ESP has proven to be a very valuable tool for investors seeking stocks that are most likely to beat earnings estimates. As indicated earlier, in our extensive 10-year backtest, we found that over the past decade, stocks with a positive Earnings ESP and with a Zacks Rank of #1, 2 or 3 ('Strong Buy,' 'Buy' or 'Hold'), produced a positive surprise 70% of the time. Investors should also note that the Earnings ESP strategy must be used in conjunction with the Zacks Rank #1-3 for truly favorable performance figures. For example, our research has shown that even if you have a positive Earnings ESP but an unfavorable Zacks Rank #4 or 5 ('Sell' or 'Strong Sell'), the chance of a positive surprise is diminished and the likelihood of a negative surprise increases. Also, if the Earnings ESP is negative, even if there is a Zacks Rank #1-3 for the stock, obtaining a positive surprise is reduced to a coin flip at 52% of the time. This research suggests that the Earnings ESP for a stock must be positive and the Zacks Rank must be neutral or better in order to find the top stocks in a given earnings season. A negative figure in either metric will greatly decrease the odds of a positive surprise. What About on the Short Side? While the Earnings ESP figure and the Zacks Rank make a great one-two punch for finding stocks that are likely to beat earnings estimates, they are not as effective predicting which stocks are likely to miss expectations. 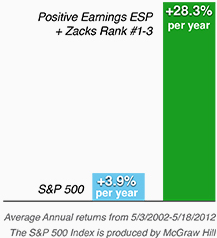 Our research shows that if a stock has both a negative Earnings ESP and a negative Zacks Rank (#4 or 5)%% of the time. While negative readings certainly suggest a greater likelihood of negative surprises, they obviously aren't as robust a predictor as what investors see on the positive side. For this reason, we suggest only applying the Earnings ESP in concert with Zacks Rank #1, 2, or 3 to find stocks that are the most likely to outperform their earnings estimates. Now that you know which groups of stocks to focus on to increase your chances of a positive surprise, let's look at the size of the Earnings ESP that has historically generated the best results. First, just having a positive Earnings ESP produces market beating results. Over the last ten years, using a one-week holding period (stocks were held for no more than one week after they reported), the average annual return was +23.5%. This is in stark contrast to stocks with a negative Earnings ESP, which produced a -9.2% return with the same time filter. If investors instead take the positive Earnings ESP and also apply a Zacks Rank filter that only looks at stocks that have a #1, 2, or 3, the performance becomes even more impressive. According to our research, over the past ten years using a one-week holding period, stocks that combined a positive Earnings ESP and at least a neutral Zacks Rank achieved annual returns of +28.3%. Investors could drill down further into stocks with higher Earnings ESP levels in order to boost their returns. For stocks that have an Earnings ESP of at least 1%, the performance jumps up to an annual rate of +29.6%. 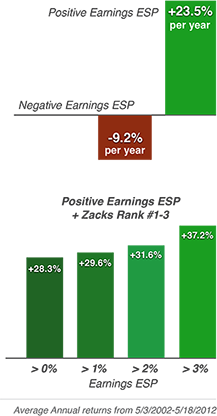 Meanwhile, an Earnings ESP of at least 2% increases returns up to +31.6% annualized, and then finally an Earnings ESP greater than 3% results in an average annual return of +37.2%. Note that there's no need to hold out for stocks with big double or triple-digit ESPs. While some stocks like that will do extremely well, there will be fewer of them, and there is no aggregate increase in performance. The next time your stock is about to report or a security on your watchlist is getting closer to the earnings date, be sure to look at its Zacks Earnings ESP and see what your stock's probabilities are of producing a positive surprise. You can find this figure on any Zacks quote overview page and stock estimates page. To see the top stocks to beat earnings, plus the latest ESP news, visit the Zacks Earnings ESP Center.